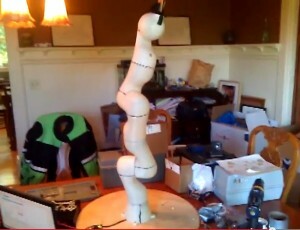 Maker n8zach has built himself an amazing 3D printed arm. The arm is powered by 1 MX-106, 3 MX-64s, 1 MX-28 and 2 AX-18As (one of which is used with our PhantomX Gripper The arm is contorlled via a PC using a USB2DYNAMIXEL and the DYNAMIXEL SDK. This arm on its own is pretty amazing, but on top of everything else, n8zach can control his arm via a Kinect. He can control the arm manually, or he can set it to automatically perform certain tasks.